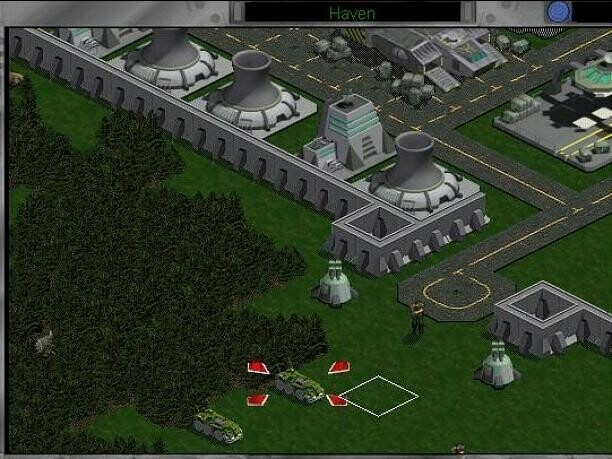 In a medium that was flooded by real-time strategy games during the late 90s, Fallen Haven emerged as one of the best. It is a game of combat and conquest. It seems the Humans and Taurans are at war. It all happened by accident, really. A human probe exploded on the Tauran homeworld's moon when the Taurans tried to open it up, taking out everyone on the moonbase. The Taurans are less then happy about it and have declared revenge. The world known as New Haven is far away from the rest of human civilization, so the Taurans have decided to invade. The war comes home. This is the situation you will find yourself in when you play Fallen Haven. You may play as the defending humans or the invading Taurans. Each has their specific strengths and weaknesses. Humans are faster and have better weapon ranges, but poorer firepower and armor. Taurans are slower and have poorer weapon ranges, but have increased firepower and armor. 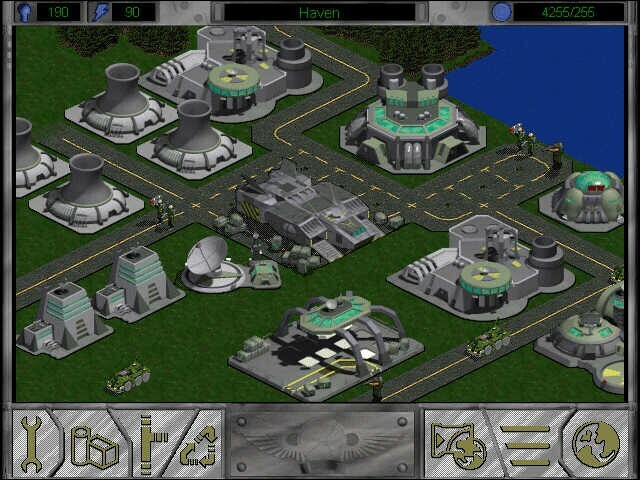 In the basic game, you each start out with one colony on far sides of the world. In between there are other colonies that are aggressive to both sides. They won't attack, but they will defend themselves if provoked. Some of these colonies have a special mission associated with them. For instance, you may have to destroy something specific to gain rebel allies. Executed correctly, these special missions can really help you build your power quickly. As a human or Tauran leader, you will develop your own offenses and defenses, then invade colony after colony garnering power and forces so that you may eliminate the enemy. The game takes place in two types of turns: strategic, in which you build and expand, and tactical, your combat turn which only takes place if an invasion is in effect. During strategic turns, you manage your resources, build energy plants, mining operations, research labs, troops, colony defenses, etc. You will also have to decide which technologies to direct your research towards. After a certain amount of time, your ability to create armor, weapons, energy, and other technologies increases. When you feel strong enough you may attack a neighboring colony by dropping troops and assault vehicles. During tactical turns (an invasion or defense) you will direct your troops and attack the other colonies. 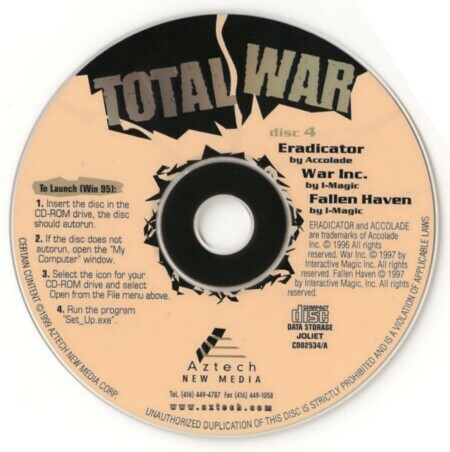 You move your soldiers and vehicles and fire on enemy troops and buildings. After you decimate a colony, it becomes yours and you may begin assembling more troops and research units. Ultimately, you need to take out the enemy capital to win the game. The graphics in this game are fantastic for its time. In tactical mode, the troop animations are well-executed and smooth. The sounds are also quite well done, you may listen to some background music while managing your colonies, and the battle sounds are also very good. Gameplay consists of simple, mouse driven pointing and clicking to examine your resources and direct their production. Keep an eye on your energy and monetary credits, structures and troops require energy and upkeep. This is a pretty easy game to learn, and it takes good, strategic thinking to master. There are multiple levels of difficulty and two campaign modes. The default campaign is as described previously, with each side owning one colony at the onset and neutral forces in between you. In the last hope campaign, the enemy has taken all the colonies except yours, and you must fight an uphill battle to come out triumphant. This campaign mode is for experienced players only. All in all, this is a good, solid, fun game. The program runs extremely well, and the game is fun to play. Some of the management gets a little repetitive during the long haul of a campaign, but the game still holds your interest nonetheless. If you are a strategy enthusiast who likes turn based games, you will want to give this one a shot. It's lots of fun, and plays very well.